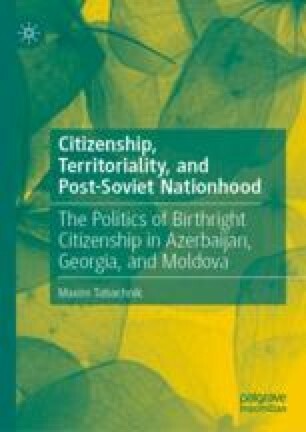 This chapter addresses the impact of the frozen conflicts on citizenship and national identity politics of the three countries paying special attention to the politics of jus soli and territorial citizenship in general. It can be summarized as territorial integrity concerns. In Moldova, such impact was the most direct: policy-makers attempted to use citizenship to recover the connection with the residents of Transnistria and prevent further separatism. In Azerbaijan, the focus was more on preventing new separatism on the borders with Russia and Iran. Academic debates there continued to search for the solution of the frozen conflict in the ancient past, by establishing which ethnic group arrived to the territories in dispute first. In Georgia, existing frozen conflicts in Abkhazia and South Ossetia only exacerbated ethnic nationalism leading to the widespread preoccupation with the extinction of the Georgian ethnos. Abkhaz Leader Speaks of Relations with Moscow, Tbilisi. 2005. Civil.Ge. http://www.civil.ge/eng/article.php?id=10572, accessed December 5, 2015. Aleksidze, Zaza. 1999. A Breakthrough in the Script of Caucasian Albany. http://armazi.uni-frankfurt.de/sinai/alban2.htm#start, accessed December 2, 2014. Frear, Thomas. 2015. Abkhazia and the West: Rehabilitating Engagement Without Recognition. European Leadership Network. http://www.europeanleadershipnetwork.org/abkhazia-and-the-west-rehabilitating-engagement-without-recognition_2370.html, accessed August 27, 2016. Hewitt, George. 1989. A Foreigner’s Observations on the Strained Relations Between the Abkhazians and the Georgians (An Open Letter to the Georgian People). http://abkhazworld.com/aw/Pdf/open_letter_1989.pdf, accessed August 27, 2016. Kakachia, Kornely. 2000. Citizenship to All Former Soviets Would Jeopardize Transcaucasus. The Central Asia-Caucasus Analyst. http://www.cacianalyst.org/publications/analytical-articles/item/7158-analytical-articles-caci-analyst-2000-10-25-art-7158.html, accessed August 30, 2015. Secrieru, Stanislav. 2015. The Two Big Factors That Could Shift the Status Quo on Transnistria. Russia Direct. http://www.russia-direct.org/opinion/two-big-factors-could-shift-status-quo-transnistria, accessed April 22, 2017. Кyxиaнидзe, Aлeкcaндp. 1997. Haциoнaльныe мeньшинcтвa Bocтoчнoй и Южнoй Гpyзии. Moscow. http://www.memo.ru/hr/referats/selfdet/Chapter16.htm, accessed August 10, 2015.